Meagan McKinnon, senior class president at Walter L. Cohen High School, left campus Wednesday afternoon with no idea of the upheaval the coming week would bring to her campus. Thursday morning, the student body was abuzz with rumors that the school was about to be merged with John McDonogh High School. At an assembly that afternoon, they found out that no merger was planned, but that the New York-based Future Is Now charter group that took over McDonogh this year would be given control of Cohen within a week, and that most of the Cohen administrators and teachers would be replaced. Stunned, McKinnon and her classmates marched out of the building. They haven’t returned to class since then, instead alternating between protests and class time on the lawn as they demand the decisions be justified or reversed. A direct-run high school under the Recovery School District with scores near the bottom of the scale, Cohen had been slated for a gradual transition to governance by the New Orleans College Prep charter management group, with each graduating class of Cohen seniors being replaced by incoming College Prep freshman until the last direct-run class graduated in 2014. On Thursday, however, RSD officials announced that because of problems observed with the school culture, the Cohen juniors and seniors would be placed under the governance of Future Is Now for the remainder of the year, with most of the Cohen staff replaced. On Monday, their third day of protesting, the students held a press conference to present their demands, asking for a role in the decisions being made, for their teachers and administrators to be reinstated, for equal maintenance of their part of the building and for school officials to compile reports comparing the direct-run Cohen students and their College Prep counterparts’ test scores, discipline records and police reports. About 30 or so of the school’s more than 100 students attended, flanked by several dozen adult supporters. McKinnon said that during her classmates’ walkout, they’ve broken into groups with their teachers to continue their classes outdoor. Cohen students have a great deal of confidence in this year’s teachers, she said, and are worried that the charter will bring in inexperienced recent college graduates to replace them. Bristling with indignation at the notion that Cohen students are “unruly or ignorant,” McKinnon said the students resent such sweeping decisions being made so abruptly. Her mother graduated from Cohen in 1975, she said, and the officials making these changes have no respect for the tradition that the school represents. “I think it’s all about money,” McKinnon said. It says these kids need people to care about their education instead of having continual upheaval of staff or physical transfer to another building. We have lived in the Cohen neighborhood for years and no one I know has had any problems with the student body. “Unappropriate” instead of “inappropriate” does not “say it all.” Their interaction with neighbors says something. They should have a say in what happens to them. On our block, when their band is rehearsing in the street for Carnival, people and kids stand on the sidewalk or second-line, shouting encouragement. I’ve lived a few blocks from Cohen for 5.5 years – we had a few VERY MINOR issues with skippers a while back (mostly opening the gate to our backyard and letting out our dogs), but over the past two years, we’ve been thrilled to see how engaged the student body has become. I love when the band parades around the neighborhood, I love watching the football team practice, and I love seeing the teacher-led photography class field trips on the odd morning I’m home. This is awful. “penning these people”? “Inner city”? These phrases are actually divisive and dehumanizing. We don’t need to “ship” people off or displace them from their neighborhoods but rather invest developing thriving communities all over the city. The most important investment we can make as a society is in public education for all communities. And, contrary to popular belief, the families in the Cohen community work and pay taxes like you. In fact, the parents who are supporting their children, took off from work to be there to protest the undemocratic and tyrannical practices by the RSD. True American heroes…This students should be given a purple heart. 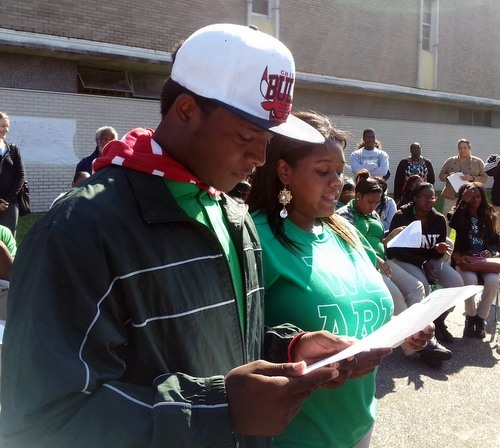 This kids have awaken to the crime that this school district and state has perpetrated since the Katrina. They are selling these schools to the highest bidder at the cost of our children. There is no real education going on with this so called education reform. The only education going on is the teachings of our children on how to be test robots. These students should not only be standing up for their demands, but they should go even further and demand that all high stakes testing come and abrupt end. They should demand that they bring back subjects such as art, drama, home economics wood shop, auto shop, apprenticeships, etc, etc. Things that will help these children in the real world, not the world of tests. They are too many adults in the Orleans Parish high school system that are being held hostage because the state refuses to give them their high school diploma. I say adults because most of these students are over the age of twenty. Students who have passed all of their courses, but because they don’t do well on test these students can’t get a job because the state is holding on to their diplomas. Go get them Green Hornets!!! Sorry, css new orleans, but how can you look at Cohen school and not see it for what it is …..segregation. Now give me your definition of “dehumanizing” again?